Are you or a loved one at risk of having diabetes during pregnancy? Have you or a loved one had gestational diabetes? Are you overweight, thinking of becoming pregnant and have a family history of type 2 diabetes? Gestational diabetes (diabetes that occurs during pregnancy) is on a steep uptick. CDC estimates that a rapid climb is about to occur from about 7% of pregnancies to about 18% - or one in seven pregnancies (1). Why is GDM, as it’s often referred, on such a rapid rise? New numbers to diagnose GDM which are lower than the previous diagnostic guidelines (see more details below). Why New Lower Diagnostic Numbers? The goal of the lower glucose numbers to diagnose GDM is to minimize problems for the mother during pregnancy and immediately after delivery. In addition, there is a goal to minimize problems for the child later in life, such as the risk of developing type 2. How Is GDM Diagnosed Now? Several international organizations, including the American Diabetes Association, has recommended that most women who are pregnant be tested for GDM (3,4). Women who are known to be at high risk for diabetes should be checked for GDM or undiagnosed type 2 (see discussion of “overt diabetes” below). Women who are not known to be at risk for diabetes should be tested for GDM (between 24 and 28 weeks of pregnancy) using a glucose tolerance test. The new recommendations suggest that the pregnant woman be given an oral glucose tolerance test which consists of consuming 75 grams of glucose and having their glucose measured 3 times over 2 hours (fasting, 1 and 2 hours). They also recommend that only one result needs to be elevated rather than two in prior criteria. Though these recommendations have come from an extensive review and an international body of experts, the American College of Obstetricians and Gynecologists have not adopted them. If you are pregnant and being tested for GDM ask what organization’s recommendations your healthcare provider is using. Women diagnosed with over diabetes don’t need to have a glucose tolerance test. They do need to understand that they have been diagnosed with diabetes. They will have diabetes during their pregnancy and continue to have it throughout life. Why Should Having GDM Cause a Woman Concern for the Future? Women who have had GDM during one pregnancy have a greater than 40 to 50% chance of having GDM in future pregnancies. This risk of GDM in future pregnancies can be reduced with weight loss after delivery and maintenance of this weight loss. Women who’ve had GDM have a 35% to 60% chance of being diagnosed with type 2 during the next 10–20 years (1). Yes, nearly half of all women who’ve had GDM go on to develop type 2. GDM is a warning sign. In fact, according to the American Diabetes Association, women who’ve had GDM, regardless of their age, should be screened for diabetes every three years (4). Yes, the yellow warning flag about gestational diabetes is being waved. Please heed the warning. Preventing GDM can reduce risks of diabetes to the next generation. Reducing weight after pregnancy can prevent or delay type 2 diabetes. Centers for Disease Control and Prevention (CDC) National Diabetes Fact Sheet http://www.cdc.gov/diabetes/pubs/pdf/ndfs_2011.pdf. HAPO study cooperative research group, Metzger BE, Lowe LP, et al. Hyperglycemia and adverse pregnancy outcomes. N Engl J Med. 358:1991-2002, 2008.
International Association of Diabetes and Pregnancy Study Groups (IADPSG) Recommendations on the diagnosis and classification of hyperglycemia in pregnancy. Diabetes Care. 33(3):676-682, 2010. American Diabetes Association. 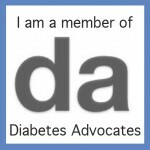 Standards of medical care in diabetes – 2011. Diabetes Care. 34(Suppl 1); S11-S61, 2011.